All right, I’m going to say it: Brony Con is insanity. 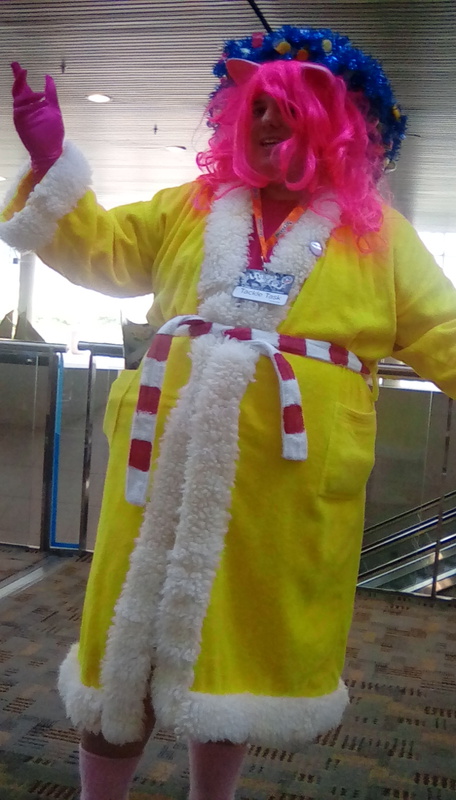 There were people dressed as candy colored ponies, some in beautiful dresses, and others in full body fur suits. Imagine the state of these people… Some costumes must be hard to go to the bathroom in, to be honest. But I did take some awesome pictures of this. Brony Con really isn’t my thing, really. It’s more or less my boyfriend’s thing. But the best thing about it was we got to stay in a nice hotel without any interruptions and no one harassing us from downstairs. Before our one year anniversary, it was a very nice thing we did. I was never a fan of My Little Pony, no matter how big of a fandom it was. I didn’t realize there was an entire convention like Otakon or Comic Con devoted to this. 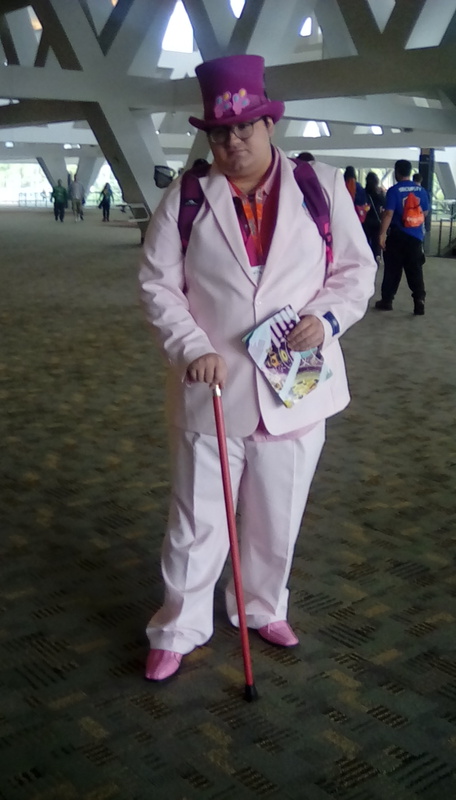 When I went to the closing ceremonies at the end of the convention, I learned than more than 6,000 people came to the Baltimore Convention Center and bought badges. That’s insane. I could have sworn I got a headache and an earache from all of this. Luckily, I didn’t. Watching grown men, like my boyfriend, get all wound up and start cheering for their favorite ponies (Applejack, Twilight Sparkle, and the psycho pink pony who needs to be on Ritalin- Pinkie Pie) was slightly nauseating, but I got over it. Actually, the great thing about this is, there’s a lot of things to do in between panels when you feel like you need a break from the overzealous Bronies. Anthony showed me the two gaming rooms, one for card and board games, called “Stabletop Gaming”, and the other one was for playing video games. There were some people playing Rock Band and Smash Bros., and there was every single kind of gaming device available from Nintendo Gamecube and PlayStation, to the newest Wii U and XBox One. We played a new card game in the Stabletop room, and we found it to help us stretch our minds a little so we could get ready for Monday night trivia. It was like Trivial Pursuit, only we had to guess the year when the event happened on each card and put them in order. My favorite room was called Quills and Sofas. Because I’m a writer, I was totally thrilled to find a sanctuary away from the crazed pony plushies to write in silence. At every table in Quills and Sofas, there was a writing prompt, and in the back of the room, there was a table with about five or seven very old typewriters. If Neil Gaiman had seen me typing out something new for my novel with a bunch of other people writing their stuff, he’d be smiling. I took about an hour and a half away from the convention and spent it writing part of a new draft of Super Frost while my boyfriend went downstairs to the vendors’ tables, or what I liked to call the dealers’ rooms. My dad told me this was one of his friends from the Shore Leave convention, who looks a lot like John Delancey, who played Q in Star Trek and Discord in My Little Pony. Here he is in Q’s robes with a Discord standing on top of his staff. Back in our hotel room, we got the hang of the waltz in preparation for the Grand Galloping Gala, but we left early because we were very tired Saturday night and we were still recovering from getting completely soaked in a huge thunderstorm downpour after dinner. Also, there wasn’t enough time to dance because the actors on stage kept stealing the dance with their performance, especially when they were dancing to a heinous and foul smelling song by Ariana Grande or Demi Lovato, one of those dreaded whiny pop singers that are on my hate list. At the gala, I wanted more ballroom dance music, not all this techno dance hip hop garbage. But I did get to wear my pretty Calvin Klein dress that I bought from Rugged. On Sunday evening, we decided to skip the after parties in the hotel rooms and spend our last night unwinding. Anthony showed me how to play the My Little Pony card game, which confused me a great deal, and we watched Avengers: Age of Ultron on TNT from our hotel television. I was already tired of the DVD the hotel channel was tuned in to, for they were playing a disc of My Little Pony: Friendship is Magic episodes on repeat. The theme song of that show still sickens me. 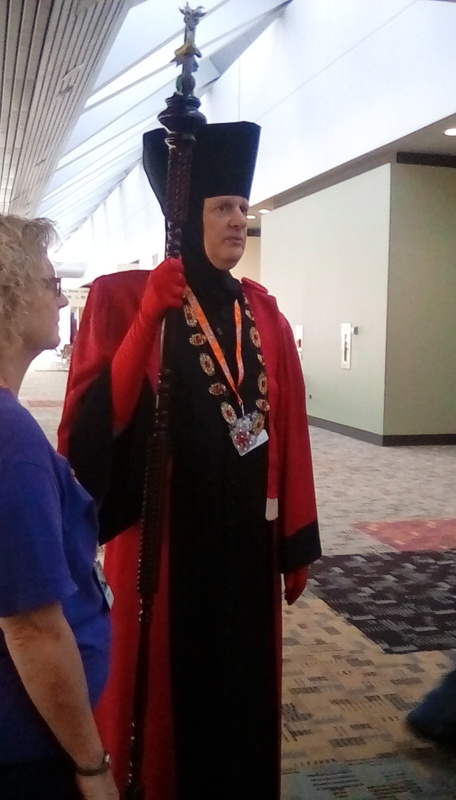 I met some people who ran the convention and told them some nice things about how the events were running, and how much I loved Quills and Sofas. 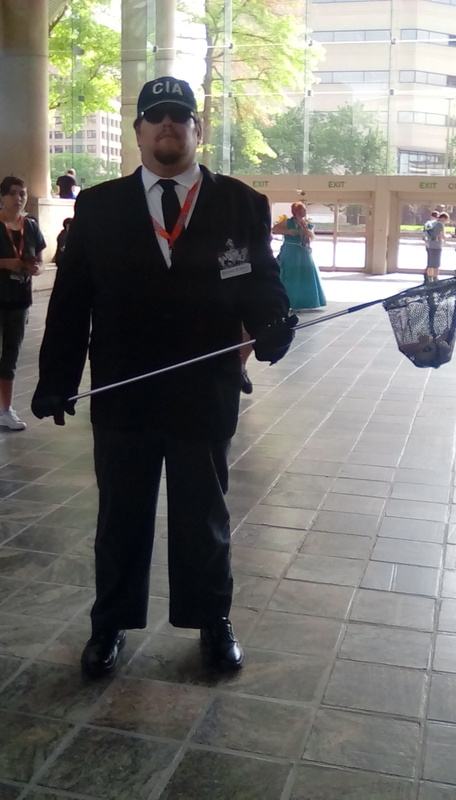 I also ran into some special guests at the con, whom Anthony admired. 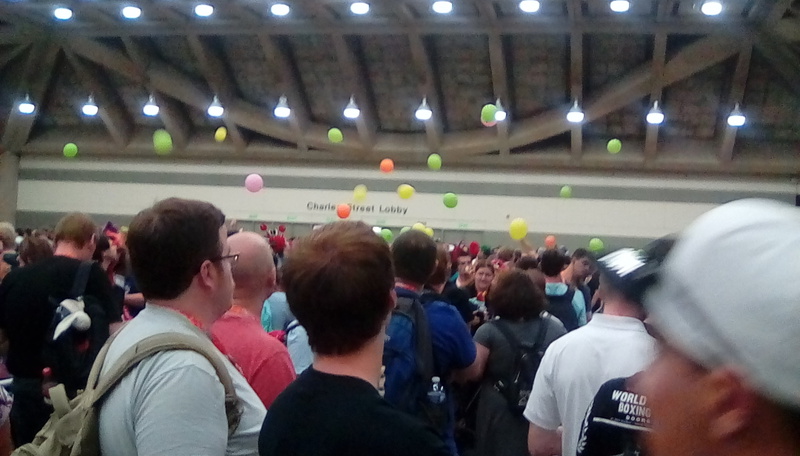 Watching the closing ceremonies was pretty interesting because of all the people waiting in line, inflating balloons and throwing them up in the air like beach balls. And the beginning of the ceremonies was insane as well, for there were tons of people jumping and dancing around in a huge conga line to dance music, all the way around the main hall. Here’s my boyfriend, dressed in one of his own put together costumes, a CIA agent working for HERD, an organization that snags ponies and analyzes them for the sake of science. But in the end, I did enjoy myself. This is a convention that I wouldn’t mind going to again, but something closer to my heart conflicts with it. Brony Con 2018 will be held TWO DAYS after my 30th birthday. To tell the truth, Brony Con isn’t really too much of my thing. It’s more or less my boyfriend’s rather than mine. When my milestone birthday comes around, which will be next year, I want to do something special, something that I like to do. Brony Con isn’t what I had in mind for the big 30, I’ve been planning this in my head for years. I still want to be able to go to karaoke with my friends Tiffany and Kerensa. Tiffany wants to take me to Medieval Times on my 30th and get me all dressed up like a princess for it. I have no idea what Kerensa wants planned, but I hope it’s a surprise party. And as much as I want my birthday to be celebrated on the actual day, we’re going to have to do it on the weekend when nobody’s working. My 30th birthday is on a Wednesday next year. 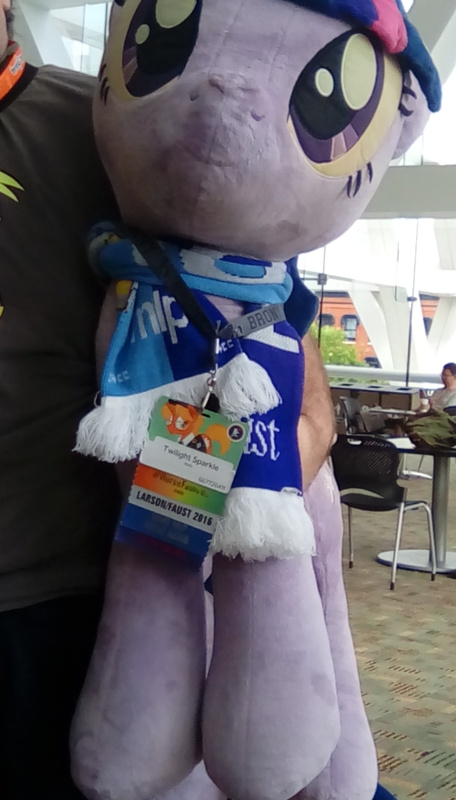 Maybe in 2019, I’ll go to the pony convention again. This year was perfect timing because it didn’t interfere with Shore Leave. Also, a party with my friends and going on a romantic dinner date with Anthony is cheaper than going to a convention for three days and four nights. Brony Con 2017 was insane, but it has its moments. And I do love the Anthologies. It’s like watching Cartoon Network’s Adult Swim. And I’ll admit it, the pony character Doctor Hooves is pretty flippin cute. I love Anthony for getting me a t shirt of him as an anniversary gift. 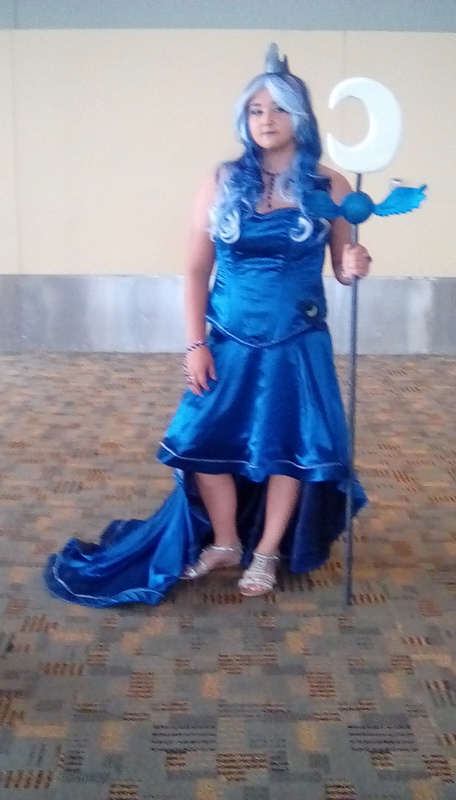 This entry was posted in Authors, Blog, Conventions, Humor, Inspiration, Literature, Nerd, Opinion, Reading, Science Fiction, TV Reviews, Writing, Writing Therapy and tagged Brony Con 2017, Brony Con Maryland 2017, Lady in the Blue Box, lady in the blue box brony con, mare in the blue box brony con, nerd queen journal brony con 2017, nerd queen my first brony con, Rachel Ahrens on NaNoWriMo, Rachel Beth Ahrens, rachel beth ahrens fiction and more, rachel beth errands, rachelbethahrens, science fiction conventions, The Nerd Queen. Bookmark the permalink.